Sunny Boy 240 scheduled to enter volume production in June 2012. 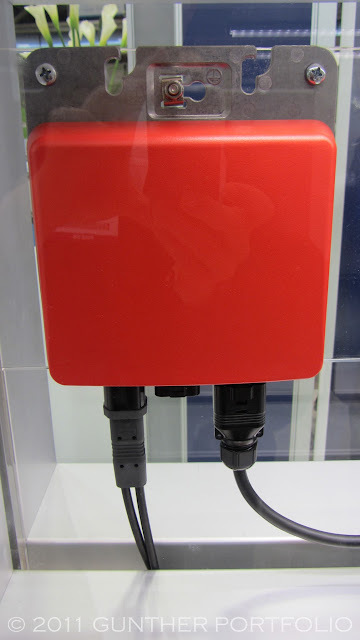 SMA Solar Technology AG (ETR:S92) previewed the long anticipated SMA Micro Inverter branded as the Sunny Boy 240 at Solar Power International 2011 (SPI11). A few of the photovoltaic (PV) module units were shown under glass providing physical form to the system concept. The Sunny Boy 240 System has a daisy chain parallel wiring arrangement of up to either 15 or 16 module units connecting through a Sunny Boy 240 Power Gateway to the grid and maxing out at either 3.6 kiloWatt (kW) AC (Alternating Current) or 3.84 kW AC. SMA has yet to determine whether 15 or 16 is the maximum number of microinverters per Power Gateway pending further testing and extensive field trials planned for the February and March 2012 timeframe. The Sunny Boy 240 Power Gateway is adapted to worldwide grid standards via a selector switch. The exact same Sunny Boy 240 module units, each rated at 240 Watt AC, and Power Gateways can therefore be installed worldwide. I understand the Power Gateway does not need to configure the module units based on the selector switch leading to potential conversion efficiency gains and system cost reductions. The Power Gateway is typically grid connected through a breaker in the electrical service panel and is offered with indoor or outdoor rated enclosures. Although the SMA microinverter product is positioned for 2 kW applications, multiple Power Gateways are possible so there is no practical limit imposed by SMA on the architecture. The Sunny Boy 240 Power Gateway doubles as the communications gateway. 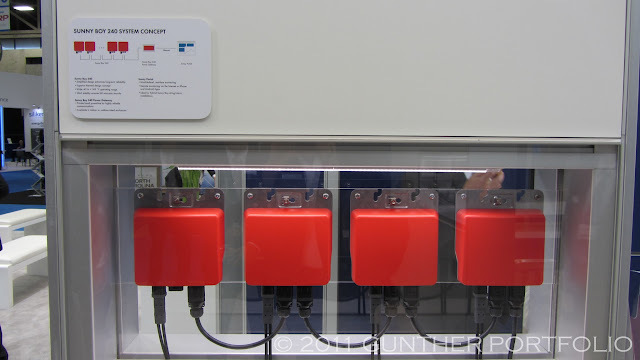 Utilizing powerline communications, the module units talk via a “private band” instead of through existing electrical wiring to the Power Gateway. The Power Gateway has an Ethernet port for further connection to a home network or wireless hub. SMA highlighted the microinverter’s compatibility with Sunny Boy central inverters for hybrid string and microinverter installations as well as off-grid systems with the Sunny Island. Likewise, the Sunny Boy 240 module unit’s DC Connector supports multiple input options with adapters cables for MC4, MC3, Tyco, and SUNCLIX connections to PV modules. SMA claims the Sunny Boy 240 microinverter has a 60% lower part count than leading competitors increasing Mean Time Between Failures (MTBF) and reliability. SMA has identified further integration opportunities to reduce component count and efforts have already begun on future designs. SMA agrees with microinverter market leader Enphase Energy on the controversial topic of electrolytic capacitors when used appropriately. Please see the Enphase reliability White Paper: “Reliability Study of Electrolytic Capacitors in a Micro-Inverter”. Similar to Enphase, the SMA microinverter is specified to operate in ambient temperatures from -40 °C (degrees Celsius) to +65 °C. SMA America was challenged before convincing SMA corporate on the value proposition of microinverters for the US and developing solar markets worldwide. As a late follower into the PV microinverter segment, SMA has been thorough in doing their competitive homework and talking with experienced Enphase installers about microinverters. The Sunny Boy 240 AC daisy chain wiring resulted from installer preference for the earlier, simpler Enphase microinverter wiring approach that was probably dropped to reduce cost. SMA decided to use a private band or dedicated AC cable for powerline communication to avoid home or commercial wiring problems that could hamper the Enphase Envoy Communications Gateway when plugged into a wall outlet. Per SMA, the Enphase Enlighten monitoring software provided too much granular data for system owners to interpret resulting in false positives and generating unnecessary installer truck rolls. SMA’s Sunny Portal system monitoring interface defaults to a status dashboard for Sunny Boy 240 System owners to simplify data interpretation and set system owner expectations for serviceable alerts. SMA has not disclosed pricing information, so it is unclear how the Power Gateway will burden small installations with less than four (4) microinverter module units. I forgot to ask how influential the acquisition of OKE was in the development of the SMA microinverter solution. Please see SMA acquires Photovoltaic Microinverter specialist OKE. If SMA succeeds in building the OKE acquisition into a leading PV microinverter market position, SMA will have once again earned the PHOTON Consulting moniker as the “Solar CISCO”. SMA refers to the Sunny Boy 240 System as the SMA Micro Inverter. Enphase used to call them micro-inverters. Let’s please settle on microinverter as the standard English term. Es sollte Mikrowechselrichter heißen auf Deutsch. Even though most German installers experienced with string design and central inverters will never bother with microinverters.